Be the first to share your favorite memory, photo or story of Marian. This memorial page is dedicated for family, friends and future generations to celebrate the life of their loved one. 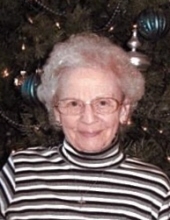 Marian A. Kretschmann age 97 of Richland Center passed away on Sunday, January 13, 2019 at Schmitt Woodland Hills while surrounded by her family. She was born on September 6, 1921 in Richland County the daughter of Clyde and Gladys (Gillingham) Poole. Marian was married on April 10, 1976 to Charles Kretschmann. She worked at Martin Manufacturing in Richland Center until they closed and then worked at the Richland Hospital until her retirement. Survivors include her daughter, Cheryl (Melvin) Purington of Richland Center, 3 grandchildren, Eric Sharp of Kenosha, Marvin Ford of Richland Center, Victoria (Peter) Tarrell of Richland Center, a great grandson, Isaac Tarrell of Richland Center, special friends, Darlo and Barb Wentz of Richland Center, Leonard and Connie Frye of Richland Center, Paul Harrison of Madison, nieces, nephews and many friends. She was preceded in death by her parents, Clyde and Gladys Poole, her husbands, Charles Kretschmann and James Sharp, a son Mark Sharp, a brother, William Poole, a sister, Lorraine Beranek. Per Marian’s request private family services will be held at a later date. Online condolences available at www.staffordfuneralhomes.com. The Stafford Funeral Home is assisting the family with the arrangements. "Email Address" would like to share the life celebration of Marian A. Kretschmann. Click on the "link" to go to share a favorite memory or leave a condolence message for the family.